In the same fashion as the Henley, the Hotspur utilised standard Hurricane outer wing panels. 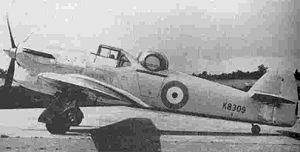 One prototype aircraft, K8309, was built in 1937, fitted with armament of four 0.303 in (7.7 mm) Brownings in a B-P dorsal turret plus one .303 in (7.7 mm) Vickers gun mounted in the front fuselage. The completion of the prototype was delayed until 1938, by which time the rival Boulton Paul Defiant had already flown. The Hotspur first flew on 14 June 1938 with only a wooden mock-up of the turret and with ballast equivalent to the weight of armament. As Hawker was committed to the production of Henleys and Hurricanes the project was abandoned. The mock-up turret was removed and a cockpit fairing installed. Planned production by Avro to Specification 17/36 was abandoned and the prototype, with turret removed, served at the RAE Farnborough on miscellaneous test programmes of flap and dive brake configurations until 1942. 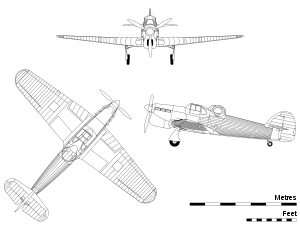 Picture - Orthographic projection of the Hotspur prototype, without armament fitted. 4 x� .303 in (7.7 mm) Browning machine guns in a Boulton-Paul turret. Mason, Francis K. The British Fighter since 1912. Annapolis, MD: US Naval Institute Press, 1992. ISBN 1-55750-082-7.